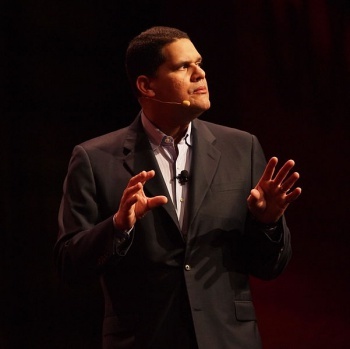 Reggie Fils-Aime prefers enthusiastic consumers over lukewarm critics. Now that the Wii U launch has come and gone, it's fair to say that it went much like many other console launches that preceded it: lots of excitement, some great games, some more forgettable games, and a few technical issues that cropped up along the way. Nintendo's Japanese arm has apologized for some of the launch troubles, including a massive day one firmware update that had the potential to brick consoles. Reggie Fils-Aime, president of Nintendo of America, has also taken some time to respond to launch critics. While he regrets the downtime the Miiverse experience, he stands behind the launch day patch and believes that consumers - not critics - will ultimately decide the system's success. "Nintendo developers want to make sure that the very best product is available to consumers," says Fils-Aime. "That creates a dynamic where our developers are working on elements until the very last point possible." Fils-Aime also clarified that while the patch will eventually come standard with each system shipped, it won't happen until 2013, meaning those who give or receive Wii Us as holiday presents should be prepared for the large firmware update. "This is quite similar to what's happened with other consumer electronic products," he points out. Fils-Aime is considerably more pleased when it comes to consumer reception, which has been mostly positive, but takes a jab at critics who suggested that the system has not yet showcased its full potential. "Reviews of a system or review of a game really come down to the quality and capability of the reviewer," he posits. "[When I] see how consumers are reacting to games like ZombiU or ... Call of Duty, that tells me we're doing something very, very positive." He also cites consumer enthusiasm on social networks as a metric of the Wii U's success. One stumble that Fils-Aime addressed directly was the Miiverse downtime on day one. He insists that the issue was not solely one of server capacity, so the Miiverse will be able to withstand the presumably large influx of new players towards the end of the month. "Come Christmas morning, those servers will not be challenged in the same way." The Nintendo of America president reiterates that any system launch comes with its own share of challenges, and insists that the big N will continue to improve the console post-launch. "In the digital, connected services area, much of what we're doing is groundbreaking, so we are having to learn as we go to make sure the consumer has the very best experience possible," he explains. As the Wii U's library and feature list grow, gamers will have the opportunity to evaluate Nintendo's growth for themselves.